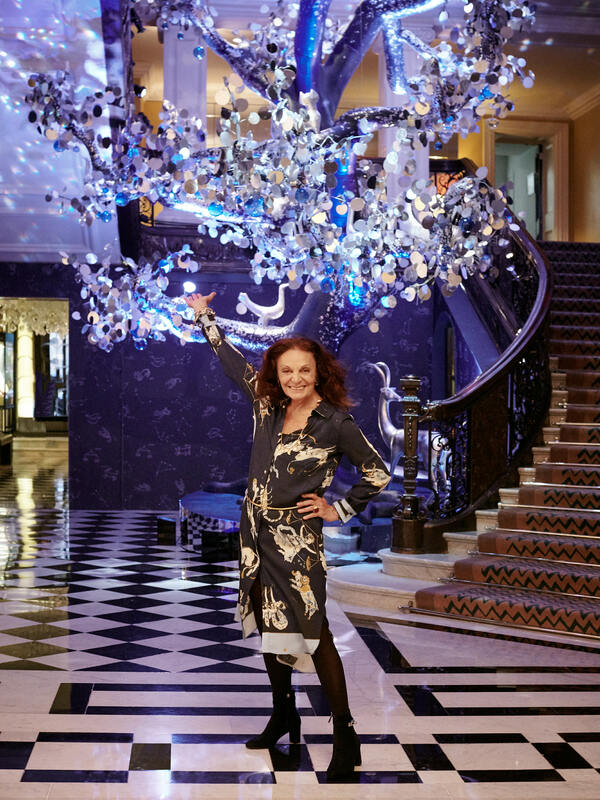 Iconic fashion designer Diane von Furstenberg has been chosen to design the Christmas tree for Claridge’s, London’s legendary Mayfair hotel. Claridge’s Christmas Tree has long been a holiday landmark in London. This is the 9th year that Claridge’s has invited a distinguished guest to reinterpret the tree in their own style. Previous designers of the tree have included Karl Lagerfeld, John Galliano for Dior, Dolce & Gabbana and more. The nearly 20 foot “Tree of Love” can be seen in the art deco lobby. 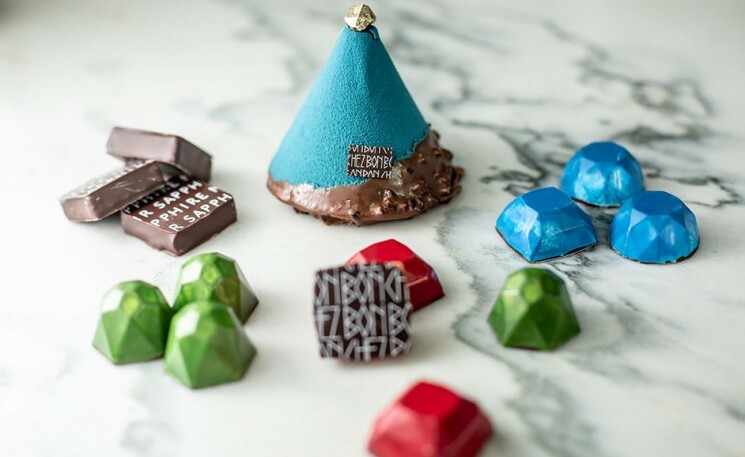 Her inspiration came from her passion and belief in the power of love, and draws from the creative influences of the ancient traditions of the astrological world. 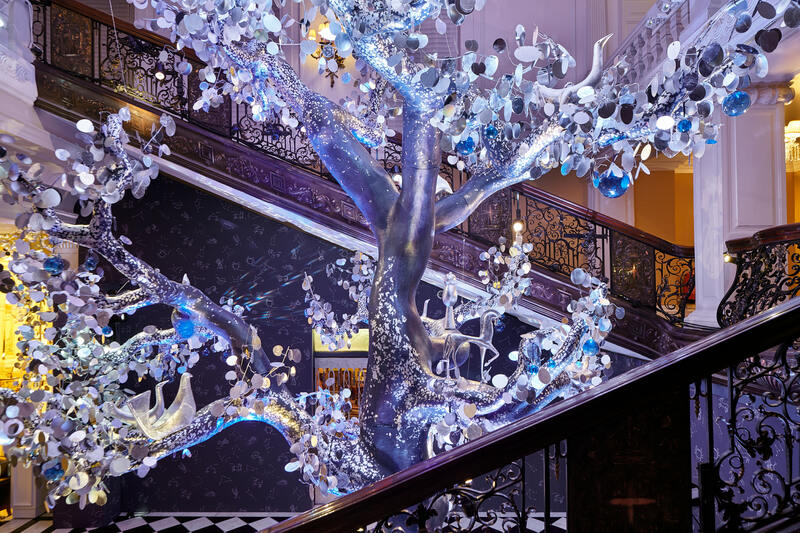 Sparkling with a blue iridescent shimmer, celestial backdrop and zodiac signs, the tree is decorated with over 8,000 had painted silver-leafed leaves, hand blown glass spheres and 150 hand-blown glass hearts. The tree also features six different silver-leafed abstract designed animals, all representing different elements. An owl representing knowledge and wisdom, a dove represents peace, a horse represents strength and endurance, a deer for gentleness, a peacock for beauty and a mouse for curiosity. Diane has also included positive affirmations such as Peace, Harmony, Truth, Freedom, Enlightenment and Wisdom in the design. The Claridge’s lobby has also been reimagined under Diane’s vision with a midnight blue skylight covered in stars and astrological star signs from the constellations. Throughout the lobby there are structural arches or silver leaves intertwined with magical fairy lights and hand blown Murano glass baubles. The “Tree of Love” was unveiled today to mark the beginning of the holiday season.